Studied by Jones and Przytycki in 1998. Constructing the (5,3) by hand! 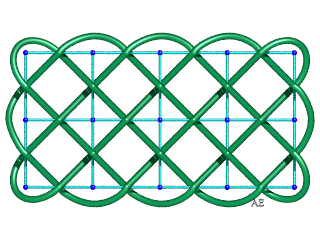 A rectangular billiard knot is the knot obtained from the closed trajectory of a ball on a billiard with rectangular edge, by modifying the crossing points in alternate above/below passages. If the dimensions of the billiard are L,L' and the ball starts rolling from a side with length L (and not in the corner) following a trajectory forming a slope a with respect to this side, then the trajectory is closed iff the ratio L/L' over a is a rational number p/q (with p and q coprime). 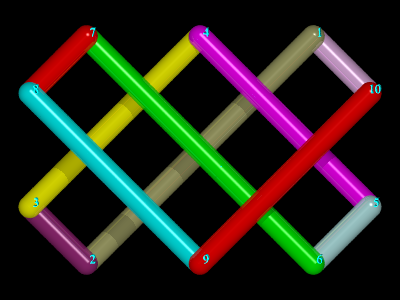 In this case, the ball bounces p times on the sides with length L and q times on the sides with length L'. 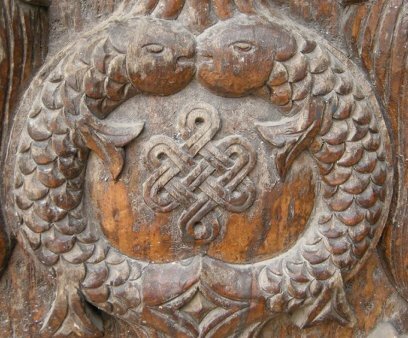 All in all, there are crossings. 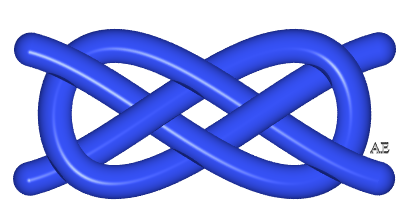 Except the cases for which they start at a corner, the curves have the same topology, and therefore yield a unique knot, that we call of type (p, q). - or that L/L'=p/q, in which case the slope is equal to one (the crossings form right angles). 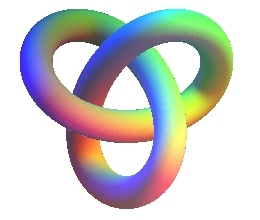 The billiard knot of type (p,q) can also be obtained from the planar Lissajous curve. Indeed, if c is an even, continuous function decreasing on and such that c(0)=1 and , then the curve gives, for , a billiard knot of type (p,q) (p > q) inscribed in a rectangle with sides p and q (for , we arrive at the corners). 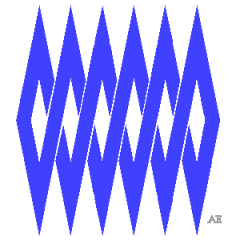 For , we get a Lissajous curve, and for , a billiard trajectory. 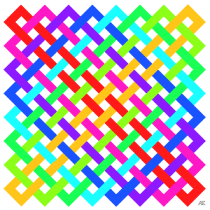 For , the bounces are evenly spaced on the sides. 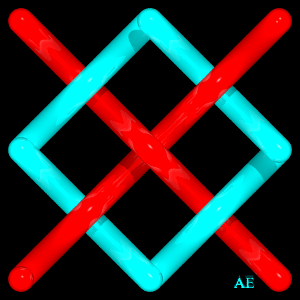 The above/below alternation can be obtained by a 3D Lissajous curve, or, which is equivalent, by the trajectory of a ball (not subject to gravitation) in a parallelepipedic billiard. Equation with the above notations: . 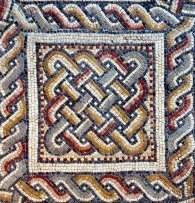 Artistic productions: Buddhist, Islamic, Celtic, Roman, or maritime art! 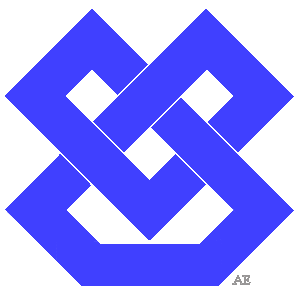 This "endless knot", Buddhist symbol, that can be found in a lot a places, is equivalent to the above rectangular billiard knot (3,2) (the two loops on top and at the bottom are superfluous). Picture taken in Kathmandu: B. Ferreol. Image taken from the very interesting blog Nico-matelotage. 1) For p and q non coprime, if we trace all the trajectories with p evenly spaced bounces on two opposite sides, and q bounces on the two other sides, then we get a link with gcd(p,q) components. 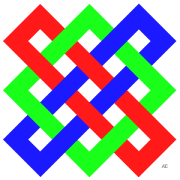 p = 2, q = 2: we get Solomon's knot, the simplest non trivial link p = 3, q = 3: link with 12 crossings and 3 components, indexed by 12x-3-79 in knotilus. 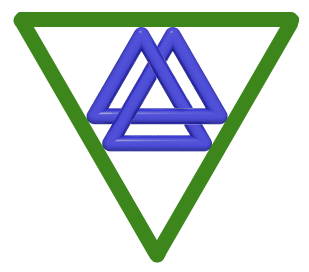 Sometimes called triple Solomon knot. 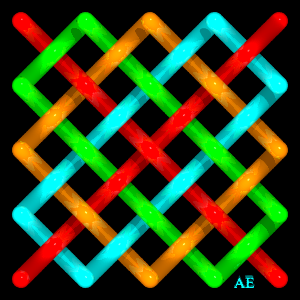 p = 4, q = 2: link with 10 crossings and 2 components, indexed by 101 in knot-atlas. 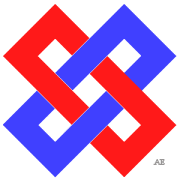 p = 4, q = 4. 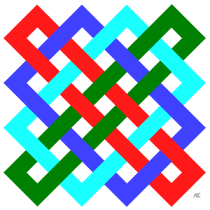 The graph of the Turk's head of type (p,q) (coprime or not) is a rectangular grid of p–1 times q–1 squares; opposite, the case (5,3). 2) We can also consider the curves obtained when the ball starts from a corner. 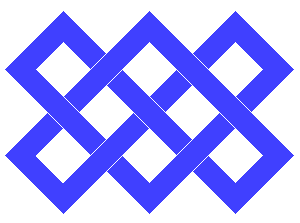 In this case, the curve is open, but can be closed in various ways; and we can superimpose several curves. 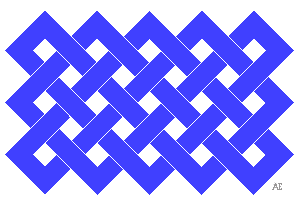 Closing only one open curve creates a trivial knot, but the superimposition of two open curves is interesting. 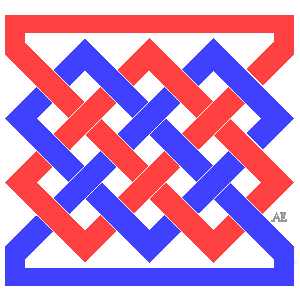 It is the Carrick bend which leads, after closing, either to the 18th prime knot with 8 crossings : 8.1.18, or to the 7th prime link with 8 crossings and two loops: 8.2.7. 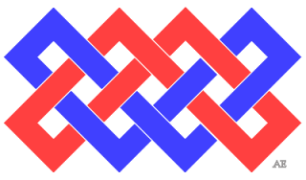 If the curve is closed, we get the trefoil knot. 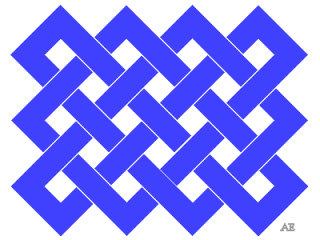 If two open curves are superimposed and the different blades connected, we get a knot with 18 crossings indexed by 18x-1-230179 in knotilus; it is used in the fabrication of doomarts. 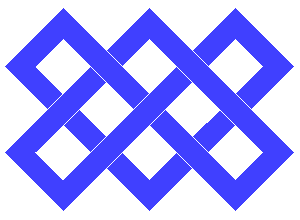 If the identical blades are connected, we get a link with 18 crossings indexed by 18x-2 - 410219 in knotilus. 3) We can also consider non alternate above/below crossings. 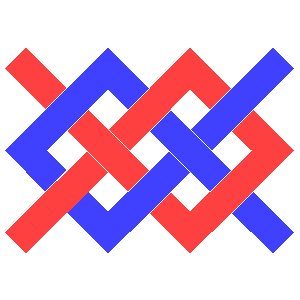 We get knots for which the minimal crossing number is less than the number of crossings of the curve. 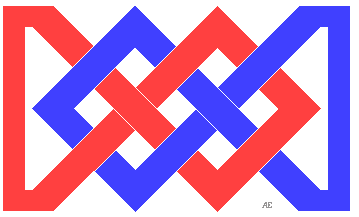 Above, two crossings can be unfolded (top-right): we get the knot 5.1.2. Here, 4 crossings can be unfolded, we get the trefoil knot. 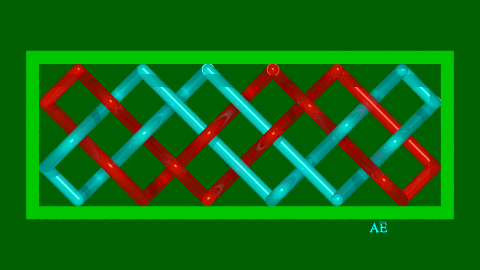 This knot was obtained by following the billiard ball with a passage below when we cross a previous line. Therefore, we can unfold starting from the end. 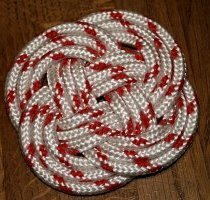 Since this works every time, there always exists a configuration yielding the trivial knot. 4) The rectangular billiard can be replaced by a convex polygonal billiard. 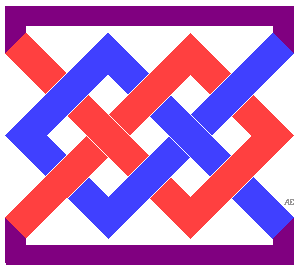 With any type of crossings, we can get all the possible knots, even by only considering billiards the edge of which is a regular polygon. 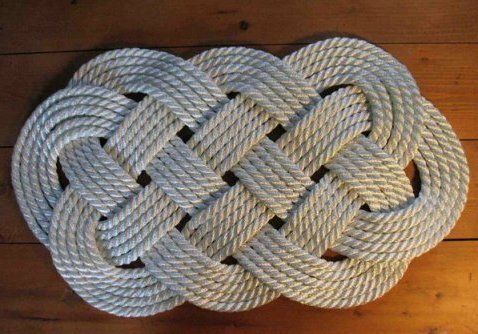 Indeed, every knot has a projection that is a crossed regular polygon. 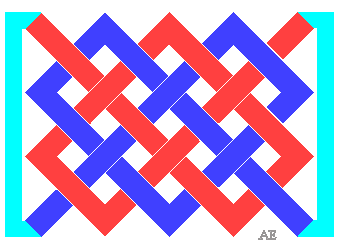 See also the polygram knots. 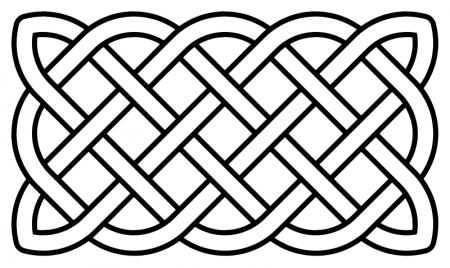 See also the cylindrical billiard knots, or Turk's heads, the linear Celtic knots. 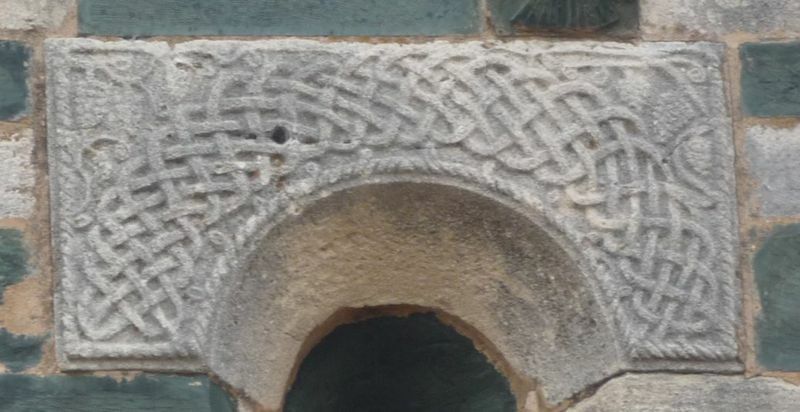 Frontispiece of the chapel of Murato in Corsica: it is a (22,3).